Erin Leege, MPH, a former WREN research coordinator and study co-author, at the 2014 WREN Convocation. Primary care clinics have much to gain by participating in practice-based research (PBR), despite the challenges of fitting research protocols into already demanding clinic schedules. Those are the conclusions of a study by the Wisconsin Research and Education Network (WREN), a statewide practice-based research network (PBRN) supported by the UW Department of Family Medicine and Community Health (DFMCH). The study appeared in the September-October 2015 issue of the Journal of the American Board of Family Medicine. PBR aims to improve clinical recommendations and organizational processes in primary care by working through collaborative networks of clinics. Those clinics serve as “real-world laboratories,” testing potential solutions and disseminating results. During its 2014 Convocation of Practices, WREN held focus groups to evaluate the experiences of Wisconsin primary care clinicians and clinic staff who had participated in its projects. 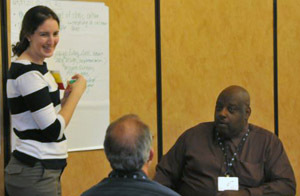 WREN conducted focus groups with 27 clinicians and staff from 13 Wisconsin clinics. Five major themes emerged: receptivity to research; outcomes; barriers; facilitators of success; and advice. Despite constraints, clinics are still willing to participate in PBR due to benefits to practice, patients. The focus groups comprised 27 clinicians and staff from 13 clinics representing 11 health systems in rural, suburban and urban Wisconsin. 1. Receptivity to Research. Participating in PBR enhanced teamwork, fostered new relationship, and provided professional satisfaction—especially when the clinic is familiar with WREN and is a partner in the research process. 2. Outcomes. PBR led to the incorporation of best practices, which in turn improved clinical care, influenced systems change and increased awareness of the value of research itself. 3. Barriers. Limited time, competing clinical priorities and implementation challenges were sources of frustration during PBR projects. 4. Facilitators of Success. Regional research coordinators were a major facilitator of PBR project success. Other facilitators included clinic staff, contracts that provided protected time, and incentives for participants. 5. Advice. Participants advised researchers to be sure to take time for project development, build working relationships with clinics, and ensure strong communication throughout the project. They also offered practical, positive advice to clinical colleagues considering PBR participation. The study authors concluded that, despite constraints, clinics are still willing to participate in PBR because of the immediate or potential benefits to their practice and/or patients. Although the study was designed to evaluate WREN projects, its themes may serve as examples for other PBRNs. Specifically, WREN’s experience can help other PBRNs better understand the infrastructure needed to conduct PBR; how to navigate issues related to health system consolidation; and how researchers, physicians, clinic staff, patients and administrators can partner on research that is relevant to all stakeholders.